Remedios Varo’s interest in nature draws on the idea that it inspires us to think of the world in relation to instinct and spirituality and that it also represents the part of the human mind which is not normally known—the unconscious, as represented in the universal emotions stimulated by the concept of nature. Adam Adamski and Bohdan Borowik suggest that there is a common heritage of all humans and animals, that ‘the purpose of the collective unconscious is adaptation of psyche to the human innate pattern and regularities […] this order is invisible and inaccessible to our consciousness’, and that such order acts as the ‘main determinants of human behaviour’, which supports the idea of nature being read as an agent for the universal unconscious. Nature at times refuses to be governed and monitored, and grows at its own pace and according to its own method, with the uncompromising attitude towards the rigid controls of civilisation. In Remedios Varo’s painting Unsubmissive Plant, a keen scientist monitors plants in his laboratory, wishing to understand nature’s patterns but he is unaware that he has transposed his mathematical mind onto the plants, causing them to grow equations instead of leaves, mirroring those formulas in his hair. Yet one single plant refuses to be force-fed his ideology and as a result its only branch of formulas has withered, returning it to its original blooming state. That such a plant is able to grow beyond his calculation and control confounds the arrogant scientist. This idea of the uncontrollable and inaccessible aspects of nature is comparable to the collective unconsciousness of Jung, which he argues as being ‘a common psychic substrate of a supernatural nature which is present in every one of us’. In contrast to the subconscious, which is forgotten or suppressed consciousness, the unconscious is not at all accessible, nor is it recognised by the conscious. That is to say, humans do not realise it exists. However, the unconscious is nonetheless active in the human mind; it is innate and need not be activated by consciousness. As Jung formulates, the collective unconscious is a universal quality innate to all men, which might explain the ability to comprehend supernatural intuitions. Varo’s Harmony demonstrates how the unconscious is crucial to the creation of art as well as the integrity of the human consciousness. The first thing that draws the viewer’s attention is the most highlighted part of the painting—the figure of an androgynous alchemist-composer. The composer searches for different objects in a treasure chest, such as leaves, flowers, shells, transparent geometric solids, and scraps of paper with hand-written mathematic figures, to skewer onto a stereoscopic music score. The expression on the composer’s face suggests that he/she is absent-minded, as if in a state of half sleep. This half sleep state of mind has allowed the emergence of a female figure from the wallpaper, who, unnoticed by the composer, helps to adjust the objects on the music score. Indeed, Varo has repeatedly used the motif of the supernatural human figure emerging from the walls to express the wonder of a sudden revelation or breakthrough to omnipresent suppression, such as in To Be Reborn, Visit to the Past, Emerging Light  and Ancestors (Fear). But in the case of Harmony, the figure from the wall emerges with a quiet and graceful air. Her eyes shut, she fills in the conscious’ blankness of mind, and perfects the music, which for Varo, is a frequent symbol of wholeness. The unconscious is portrayed as a gentle working of the mind which silently works alongside the conscious and thus completes the mind’s integrity. In Harmony, Varo has visualized the multiple layers of the unconscious and its intersection with the conscious. The composition of the painting invites the eye to start from the foreground where the composer sits with the figure in the wall, and then gradually move into the further depths where a similar figure in the wall works alone. Then the eye is directed to the bookshelf in the background, the bed, the windows and the red void outside, and then back to the doorway out through which a bird flies, and the floor tiles pushed open by thin sheets of fabric and plants. First, the background figure rising from the wall is working on a seemingly aborted work of the composer, again representing the invisible functioning of the unconscious as well as Varo’s belief in animism, which refers to ‘certain non-human beings, whether animals, plants or “things”, […] regarded by many societies […] as having characteristics which conventional Western or Euro-American rationality associates exclusively with human persons, stressing the spirituality of all objects in the world, even, wallpaper. Next to the second wall-figure are the bookshelf and the bed. Placing the bed above the bookshelf can be read as a play on the relationship between the conscious and unconscious, where civilisation and knowledge is to support the dream, the most evident form of the unconscious. The double windows near the ceiling, together with the red, curved and wrinkled bed, forms the image of a face’s eyes and lips highlighted in red, which can be interpreted as the unconscious sensuality of the human mind. On the right hand side of the room is a doorway to the outside, filled with a brownish void, its fog creeping into the study. A bird, whose greyish blue colour matches with the interior of the study, flies into the brown fog symbolising the unconscious; this vivid contrast in colour between the interior and exterior can be read as the intersection between different levels of consciousness. The grey wallpaper of the study, representing one level of the unconscious, is led on to further, deeper levels represented by the brown outer area. 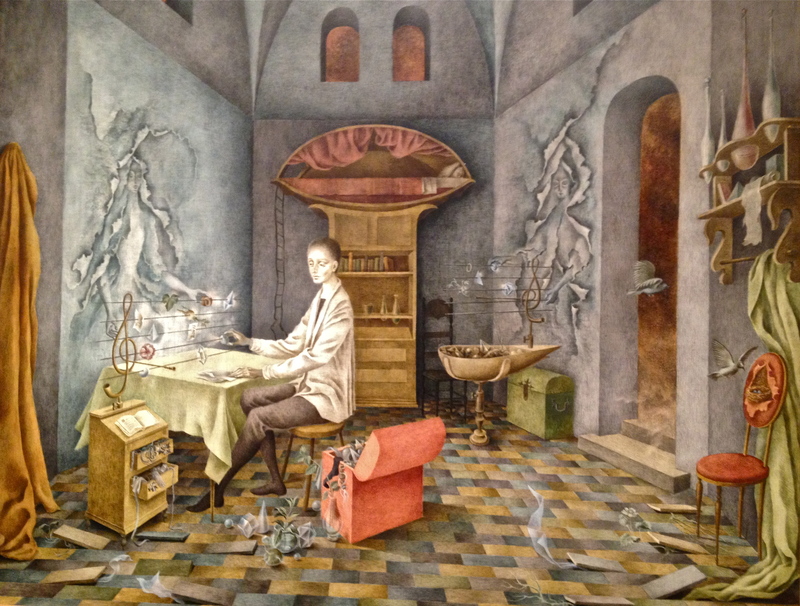 Another hint of Varo’s play of the different levels of consciousness and unconscious is expressed by the red chair placed in the far right of the room, with a nest of birds bursting from its back cushion. Again, there is a clear emphasis of the contrast between the colours red and grey. The nesting of the bird on the torn seat cushion inspires bizarre fascination. The bird nest’s location is unexpected and ‘anti-natural’, as the chair back is hardly where one would conventionally see a nest. Yet what is more natural than the bird finding wherever possible to nest? It is not uncommon for animals to comfortably make their homes in objects abandoned by humans. This particular image is interesting in the sense that it uses animal’s instincts of survival as representation of the inexplicable and inevitable features of the unconscious. The image of objects splitting the surfaces of chairs as a challenge to the concept of space is a recurrent theme in Varo’s work, arousing a mild shock in the viewer’s mind, and encourages them to see this illusion as the representation of the unconscious, emphasising its significance in forming the complete human consciousness. Another visualisation of the unconscious’ unnoticed existence is the pieces of grey fabric resembling that worn by the wall figure creeping into the study from under the tiles, alongside several sprouts of vegetation. The image of plant vines and fabrics silently invading the conscious space can be unnerving and disturbing, as it creates the sense of an invisible and unmonitored consciousness looming over the conscious part of the mind. The role of the invading plant draws a parallel with the wallpaper symbolising the unconscious. On one hand it is unnoticed by the composer who is focusing fully on his consciousness, and stays out of the main focus of the whole painting, and on the other hand, demonstrates its undeniably significant existence, making use of the characteristics of climbers silently taking over spaces. Adam Adamski , and Bohdan Borowik, “Jungian Theory Of The Collective Unconsciousness In The Light Of Quantum Psychology”, Cross-Cultural Communication, 10 (2014), 86-96. Remedios Varo, Unsubmissive Plant (Oil on Masonite) (Private collection, 1961). Carl Gustav Jung, The Archetypes And The Collective Unconscious (London: Routledge & Kegan Paul, 1959), p. 4. Remedios Varo, Harmony (Oil on Masonite) (Private collection, 1956). Remedios Varo, To Be Reborn (Oil on Masonite) (Private collection, 1960). Remedios Varo, Visit to the Past (Pencil on paper) (Private collection, 1957). Remedios Varo, Emerging Light (Oil on Masonite) (Private collection, 1962). Remedios Varo, Ancestors (Fear) (Pencil on paper) (Private collection). Janet A Kaplan, Unexpected Journeys (London: Virago Press Limited, 1988), p. 178. Marc Brightman and others, Animism In Rainforest And Tundra [accessed 29 April 2016].